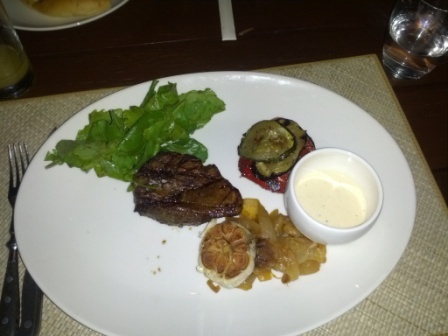 Recently I went for dinner at the Safari roof top grill house at the Hyatt here in town for the first time this "winter" as they have lowered their pricing and I wanted to check it out. It's pretty much the same as before, but the 3 different prices are now including all taxes: RO 25, 30 or 35 for various different main course options, before it used to be these prices, plus the taxes - so thats a nice saving on the old pricing schedule. Of course all of these options include a salad bar and soup option to start, the main course, and a selection of amazing deserts. And then there is of course unlimited selected beverages (includes wine and beer as well). In the past I've had many hazy nights on the roof top and have broken a personal best record for the number of bottles of Tiger consumed in an evening a few times there! The salad bar was really good, but it didn't contain the usual suspects (tomatoes / cucumbers etc), and I personally didn't mind. The salad mix that I made for myself was really good, and to be honest I considered going back for more but knew I'd have to save room for the rest of the meal! The soup option was cream of mushroom on the night that I went, and as I'm not a fan of that I didn't try it so I can't really comment on that! 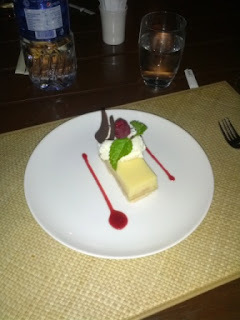 The lemon thing was so delicious, I want more of it! All in all we had a great time, and with the mashed potatoes aside, everything was perfect. It's definitely worth considering if you want to celebrate someones birthday or just have a get together with friends, or even a nice quite meal in the week with a few drinks. To make a reservation you can email muscat.dining@hyatt.com or call 2464 1234. Looks delicious! But still, waaaaay too expensive. I mean, c'mon back in Canada we could eat like this for 35 CAD dollars per person. That's like 3x overp[riced still. Sometimes though, I do not care. Stop the press: We aren't in Canada! How much do you pay to fill you gas tank up in Canuckistan? 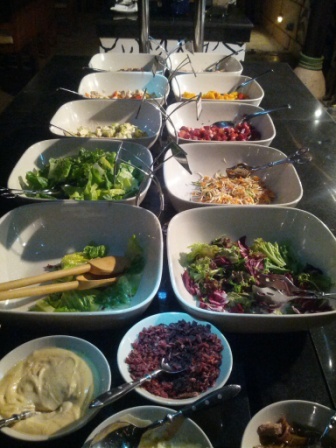 Sythe- do you get unlimited desert like the salad or do you get to choose one of the six? Eww i don't fancy eating a 'desert'....all that gritty sand in your teeth! Seriously tho, it's a great deal and I can't believe it's been so long since I was there, so thanks for the heads-up! 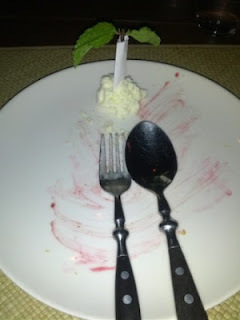 Nicely spotted- you'd think I'd know my dessert from my desert being in this cuntry. Anonymous: I don't know, I always had a driver;p. Yes, even in Canada. No, but serriously, hotels and alot of restaurants way too overpriced in Oman. I know ingedients should cost more (like gas in Canada) since both a imports, but not to the extent they are in Oman. You are correct- Oman is a very expensive place to live, work and play in. Unfortunately the hotels have massive overheads to cover such as inefficient staff, tourism levies and the like. They also have little competition as people who want a drink with their meal need to go to a hotel or one of the few restaurants that serve outside the remit of a hotel, ones with wasta enough. Food and drink somewhere like Left Bank is much more and you run the risk of having your stuff stolen to boot! OPNO - something also to note, a little known fact, Canada does not import oil for domestic petrol supply - a fact that Petro Canada and the rest of them don't want Canadians to know because they always jack the fuel prices up whenever there is some unrest around the world in an oil producing country! Having said that, gas right now in Red Deer Alberta is about $0.98/ litre! Lowest it's been in ages! 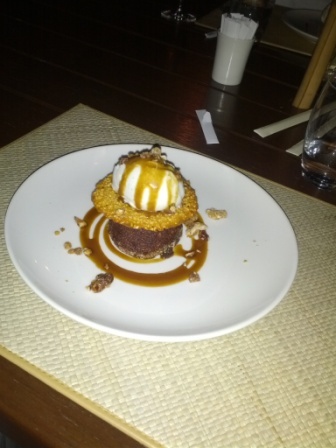 Stop bringing logic and facts into the argument and answer the question about the desserts! 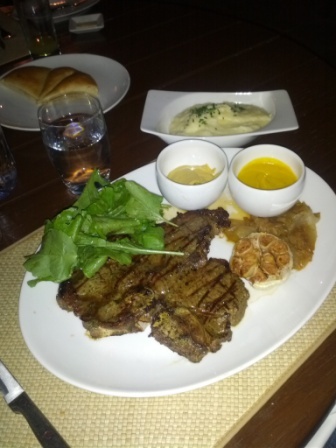 How would you compare there Steak to The SteakCompany? Your article is so informative...i like your beautiful different food pic.